Tesla's share price closed down 8.2% after the electric carmaker warned on profits following a 31% drop in vehicle deliveries during the first quarter. The firm blamed problems with shipments to Europe and China, where it began selling its Model 3 car for the first time. Total deliveries hit 63,000 in the three months to March, below analysts' forecasts which had already been cut. Tesla now expects quarterly profits to be "negatively impacted". The company encountered problems shipping the Model 3 to China in March after customs authorities suspended clearance because of misprinted labels on certain cars. 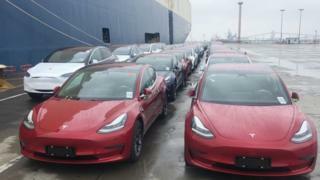 Tesla also saw shipments disrupted in Europe following strike action at the port of Zeebrugge, where its vehicles are delivered before being distributed to a number of countries in the EU. The carmaker's shares dropped nearly 9% in early trading in New York to $265.9 each. Analysts had expected Tesla to deliver 82,000 vehicles between January and March, but this was then reduced to 71,350. In the fourth quarter, Tesla delivered 90,700 cars. The Model 3 is key to Tesla's future. It is the company's lowest-priced car and Tesla is building a manufacturing site in China which will allow it to cut shipment costs. However, analysts were also spooked by a sharp fall in deliveries of Tesla's Model S and Model X vehicles. In the fourth quarter, Tesla delivered 13,500 Model S models and 14,050 Model Xs. But in the first quarter, that dropped to a combined 12,100 cars, which analysts at banking group RBC said was "very disappointing". Meanwhile, Elon Musk appeared in a Manhattan court where a federal judge urged the billionaire to settle contempt allegations by the US Securities and Exchange Commission over his use of Twitter. The SEC has asked that Mr Musk be held in contempt of court for allegedly violating an agreement which restricted his use of social media to talk about Tesla. It followed a tweet last August by Mr Musk that he could take Tesla private for $420 per share. In a subsequent tweet, Mr Musk said he expected Tesla to produce 500,000 cars this year. At the hearing the SEC stopped well short of recommending Mr Musk's removal as chief executive or even from the electric car company's board. District Judge Alison Nathan gave both sides two weeks to work out their differences, and said she could rule on whether Mr Musk violated his recent fraud settlement with the regulator if they failed. Mr Musk declined to discuss the hearing as he left the courthouse, surrounded by a horde of reporters, photographers and television cameras, but said "I feel very loved here".